The Iranian-made air coolers work with less than one ampere, as compared to the 16 ampere that are needed to power conventional air conditioners. This is important in a camp where demand for energy often exceeds the supply and power outages are a daily occurrence. In the coming months, temperatures will rise to even higher levels, making it unbearable to stay both outside and inside the tents without a cooling device. More than 3ooo Yazidi families from the Sinjar region live in the Khanke camp, and many more in informal settlements scattered in the small village next to it. All of them fled from systematic persecution by ISIS and sought refuge in the Kurdish province of Duhok, which currently hosts about 450,000 IDPs and an additional 100,000 Syrian refugees. 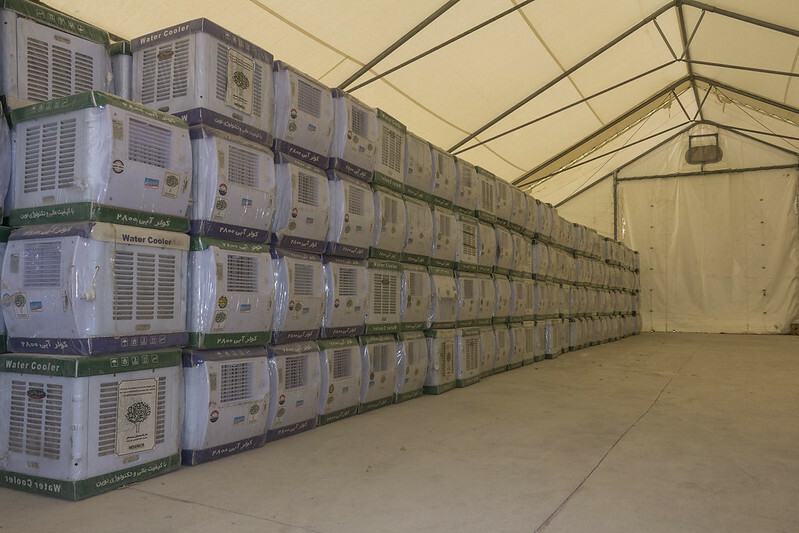 The distribution of the air conditioners was made possible through financial support by Misereor, a German charity organization. It is part of a series of humanitarian relief to displaced Iraqis, among them Yazidis living on mount Sinjar. For more photos of the event, please click on the picture below.